We play the battle over the next weekends and I will update here the AAR and you will get many photos. As you see, I used my old prussians and some bavarians as dutch troops. My austrian fieldmarshall got the job to portray Waldeck because I know Waldeck in such a white uniform only. I myself had the allied forces under my command, my wife had the french army. My plan was a frontal assault on the French guards and line between the Bois de Barry and Fontenoy. On the left Ilten should Support the dutch attack on Fontenoy and the entrenchements there. 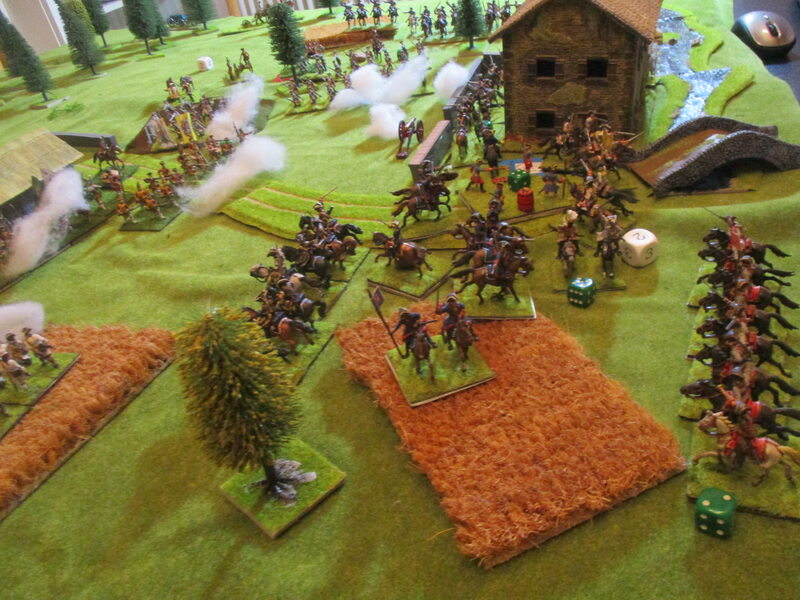 The first step was to pass throu Campbells cavalry with my first line of infantry. That worked well and soon there commenced heavy shooting. I (Cumberland) rode to Ilten to get his advance take place. 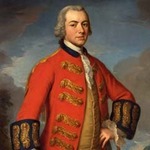 Ligonier is a dashing commander and don't need any encouragement. Fontenoy was occupied by a single unit ( = Brigade) of French line infantry. The garde de Voet leading Waldecks attack column was shot early in the battle by the unit placed in the redoubt. Waldeck send me a letter, that Hessen-Birkenfeld's Brigade would advance but that there is a killing ground between Fontenoy and Antoing - not a propper place for a frontal charge with horse. Cronström refused to move. Oh my goodness! Always these dutch quarrels! It was now very likely that the attack of the Garde de Voet was isolated and had no chance of success. But it was all to late. 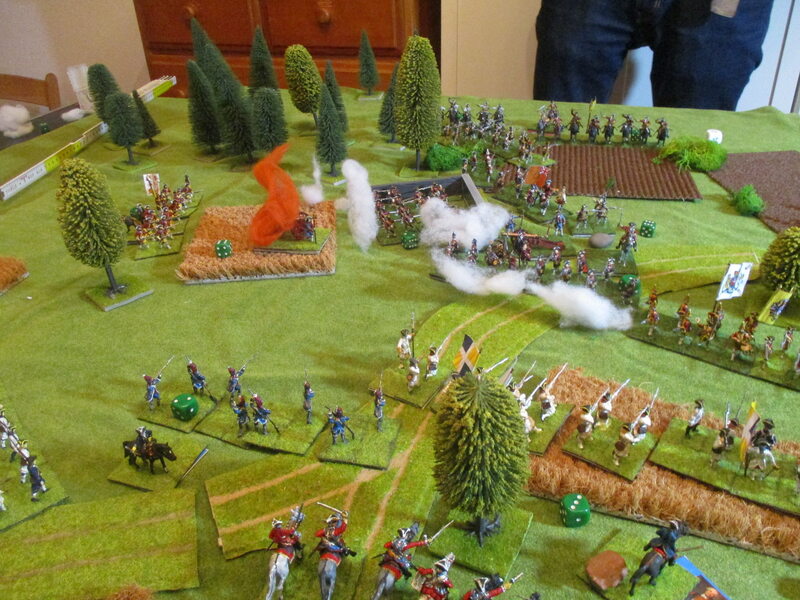 At this Moment my right wing engaged with some vexing Frenchmen in the Woods. 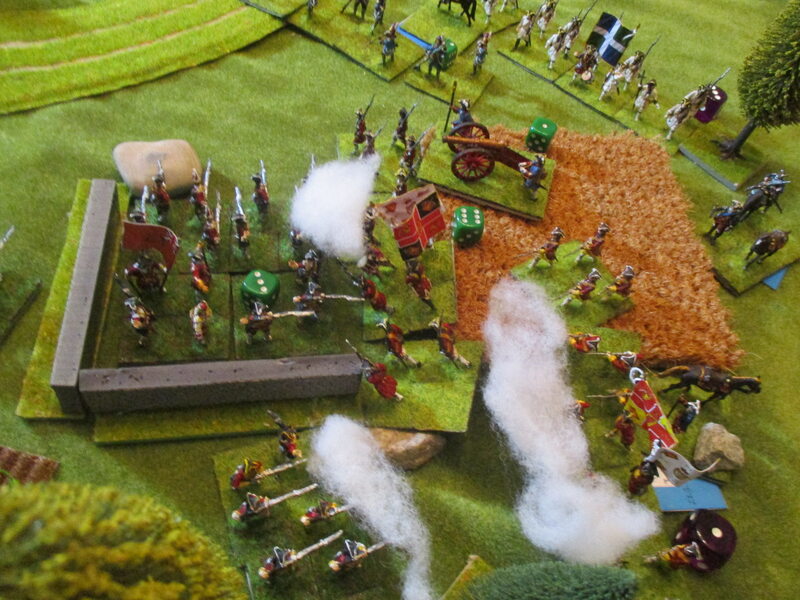 Ingoldsby returned from his post and informed me, that his troops found some unexpected resistance there. I answered that the british had there bayonets to deal with such a thread. The French evaded away and my right wing occupied the wood. 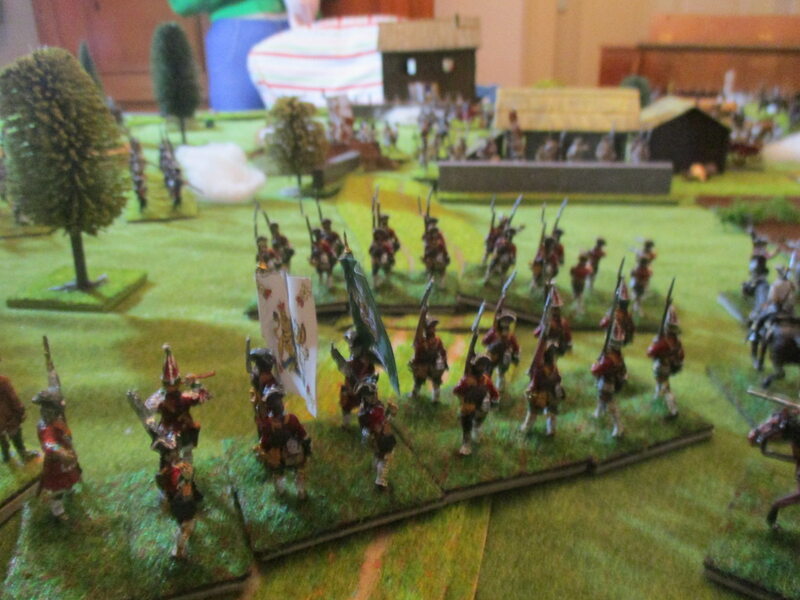 After some volleys Grammont lost his nerves and ordered the guards to charge my elite infantry. We welcomed them very well, but my elite suffered heavy too and had to fall back to Rally. The Gardes Francaises were done for! 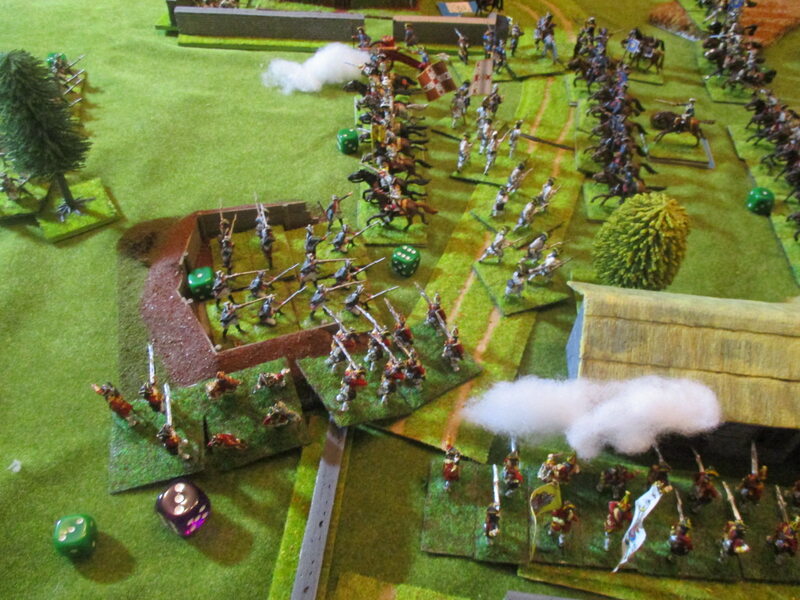 Ingolsbie's unit had now to engage the redoubt d'Eu, but had to fall back. My retreating right wing informed me, that the French advanced at the Bois de Barry with horse. Very well, I thought, and ordered Campbell to wheel his cavalry at the right. At this moment I ordered a frontal all out assault with Ilten's troops (double movement thanks to some encouragement) on Fontenoy. 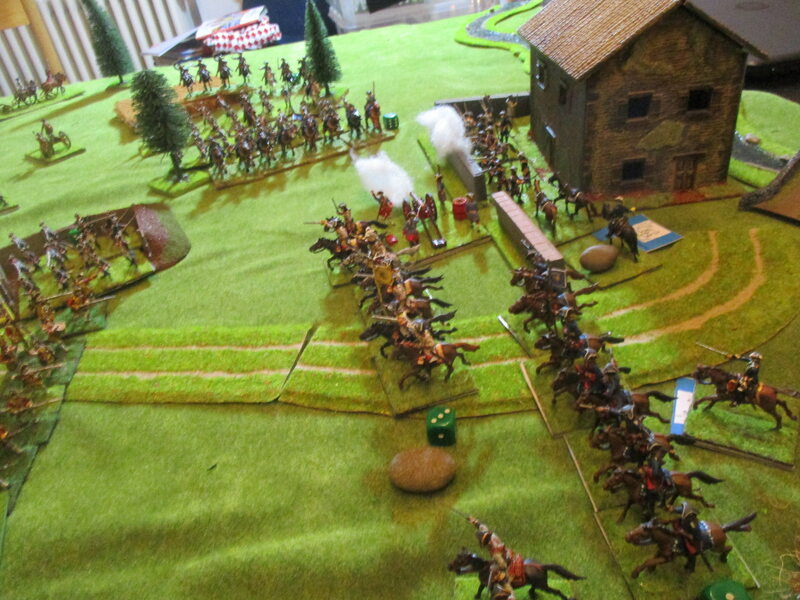 The defenders shot but now my leading unit had more Support and could destroy the bloody French. 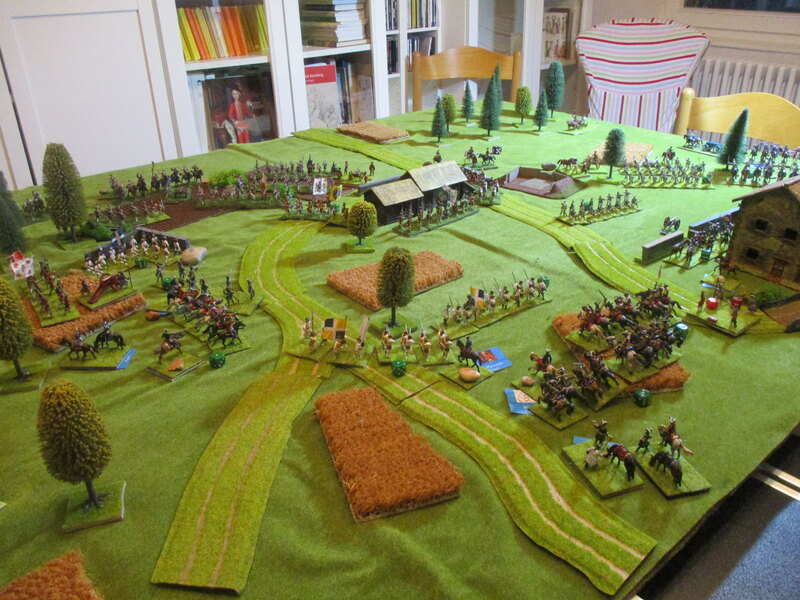 Although my hanoverians had heavy losses too and I don't know if they could hold Fontenoy for some time. Waldeck's assault column charged but without Cronstöm's Support. In fact there was no alternative. The dutch elite was destroyed and fled into the following infantry. De Saxe had ordered most of his horse to move at his right wing. That was a serious thread to Hessen-Birkenfelds poor fallows who had done nothing until now except to get shot by French musketry and canonball. Cumberland loved to discuss with his commanders, altough he never really listened to them and the most important result was to loose time. Campbell: Your, Royal Highness, my cavalry will do his duty, but I will not charge any of these vexing French bastards in the woods. That's not a job for cavalry and I hope your royal highness learned your lesson from Ingolsbys attempt to clear the wood. Königsegg: Es steht recht schlecht um unsere Sache. Die Einnahme von dem Dorfe Fontenoy darf uns nicht zu der Annahme verleiten, wir hätten nun die Schlacht gewonnen. Im Gegenteil, Königl. Hoheit. Mit Verlaub, der Besitz von Fontenoy setzt uns mehr in Zugzwang denn je, denn die Bataillone so darinnen, sind völlig erschöpft und hielten keinem Gegenangriffe stand. Setzen wir allerdings zuviel auf eine Verstärkung so blieben uns keine Truppen am rechten Flügel. Fontenoy darf uns kein zweites Blindheim werden, wo Tallard eingeschlossen ward. Wenn ich bloß tausend Kroaten hätte, um die feindliche leichte Infanterie zu beschäftigen. Ligonier: I'm sure, that our repelled batallions need your encouragement. I believe in their worth. But I plead you to be carefull. 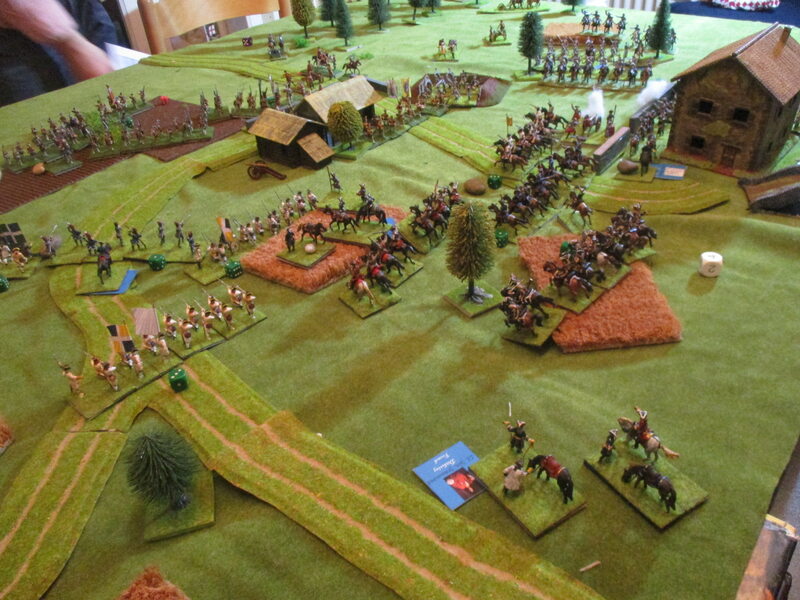 The French have very fine positions. We must rely on our hanoverian comrades. They fought very well, but there is so much more to do. Waldeck (durch einen Boten): Cronström und Hessen-Philippsthal wollen von einem weiteren Angriff nichts wissen. Im Gegenteil hat sie das Beispiel unserer Garden verzagt gemacht. Philippstal sagt, wo er da bleibt wo er ist, brauche er bald nur noch die Kadaver unserer Gäule vor den Wällen von Antoing zu zählen, denn da ist kein Ruhm zu gewinnen. Ich kann nicht meine einzige Brigade, die mir noch bleibt riskieren, will aber mit meinen Geschützen die Schanzen vor mir beschießen, um einen Angriff durch die Eroberer Fontenoys zu unterstützen. Cumberland: Well, very well. We attack! Damn the bloody dutch! Good looking battle and interesting action thus far. And now we continue to follow the battle. You may remember, that I (Cumberland) decided to not hear at the more cautious generals. Clermont-Tonerre had ordered his Maison du Roi out of the Bois de Barry and now he was not sure what he should do with them. Than he had chosen the most natural decision to charge into my cavalry. 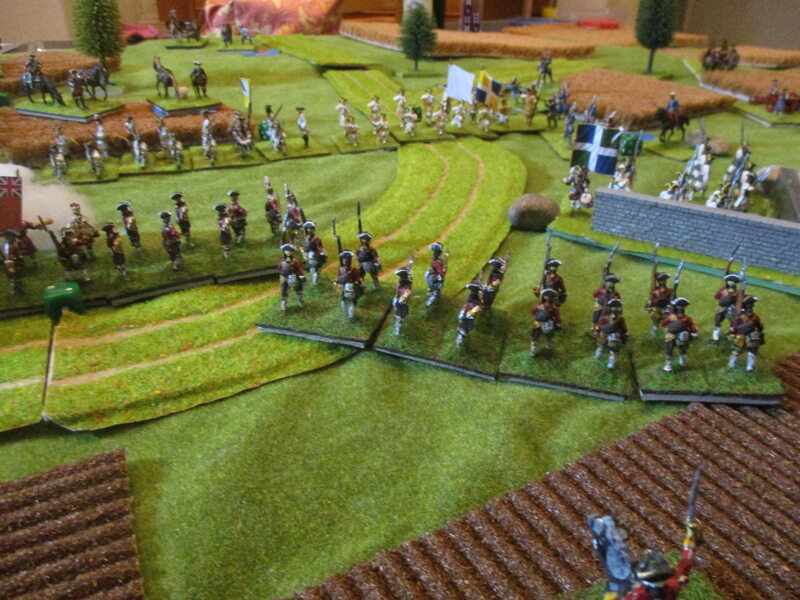 At the same moment I ordered Pulteney's to charge a nasty french light battery at the outline of Fontenoy. You may note that behind the troops of d'Estrées de Saxe came to rally the units. But the hanoverians were too near. 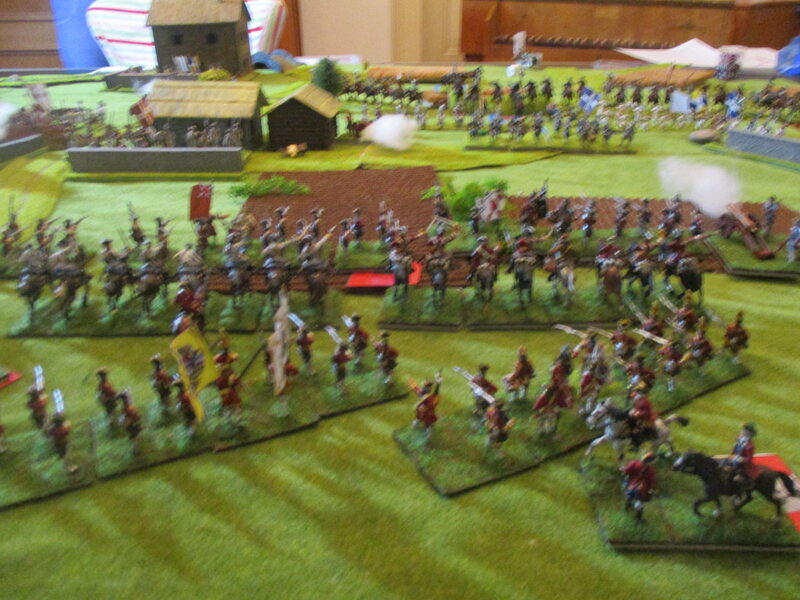 After my elite infantry was repulsed before, Ligonier send his last fresh troops forward to storm the redoubt d'Eu. I feared that it would not have success. 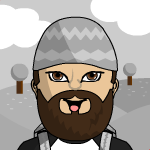 But I relied on a more serious attempt. 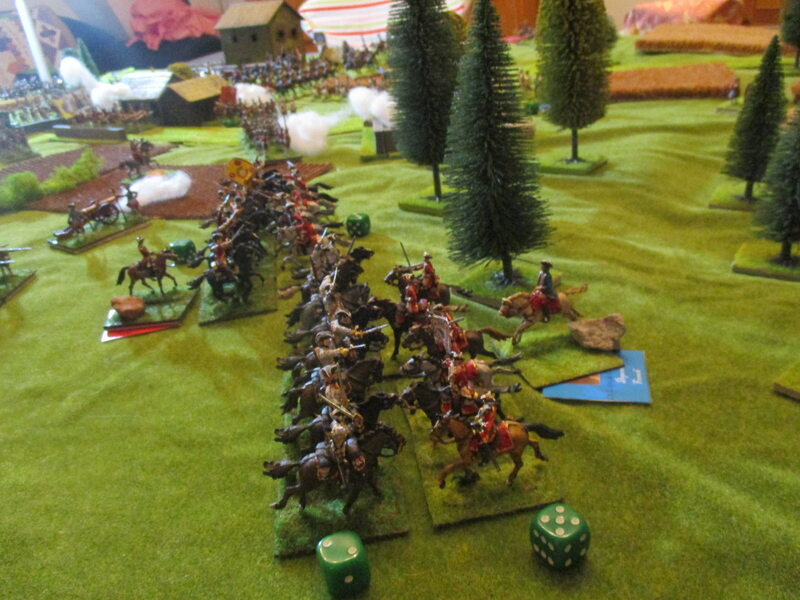 My hanoverians behind Fontenoy had to storm across the street and charge the entrenchements near Fontenoy. French volleys did again great work but could not destroy Iltens troops. Waldeck ordered his last infantry to storm the redoubt too. At this time Cromström moved at last. But he saw himself in front of a very effectively shooting French medium artillery. Now the dutch began some sort of a dance. They advanced, get 2 hits per turn and had to send back their troops and advance with fresh troops. That was a good tactic that the enemy was hold in position and the dutch lost not one single brigade. By the way, there was a critical moment there. 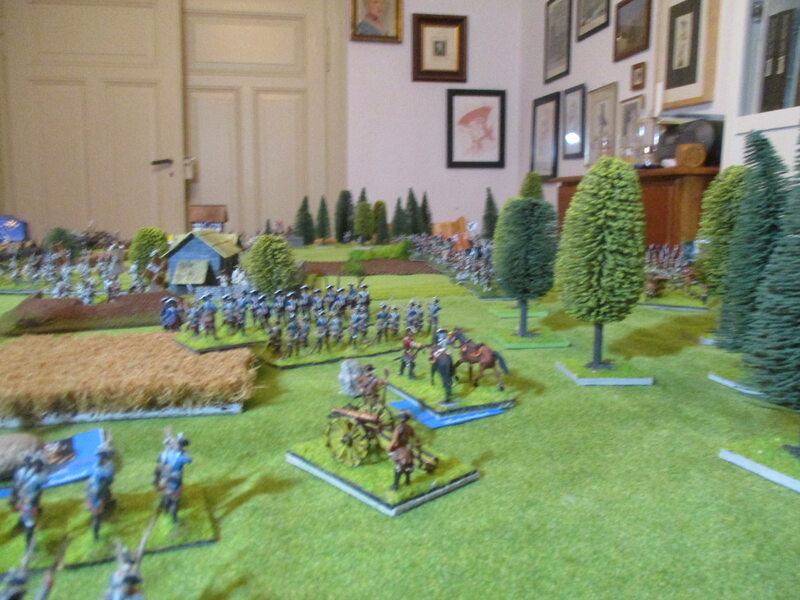 I had send forward Cronström at the same Moment, when the French horse had their chance to charge them with enormous Advantage in numbers. 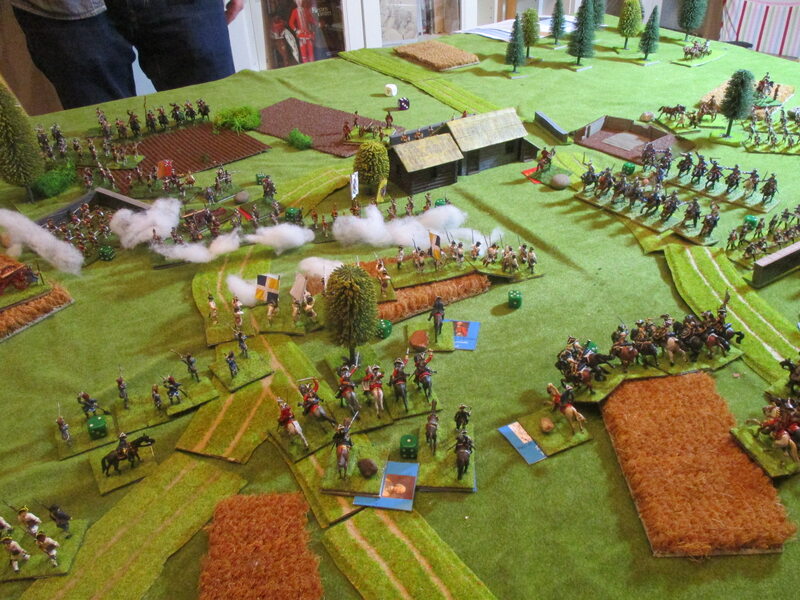 But after changing Position by Cronström, Hérouville clearly feared to get shot down by the dutch infantry. I myself rode to Cronström to speak to him. If he would hold his Position, the time was running in our favor! The melee at the bois the Barry was short and decisive. The gendarmes&chévaulégers de la Garde were whiped out, the mousquetaires were repulsed. Although I forbit it, our horse moved forward to pursue the French. I heared that some of them saw lines of rested French infantry behind the bois de Barry. And not only infantry but irish! 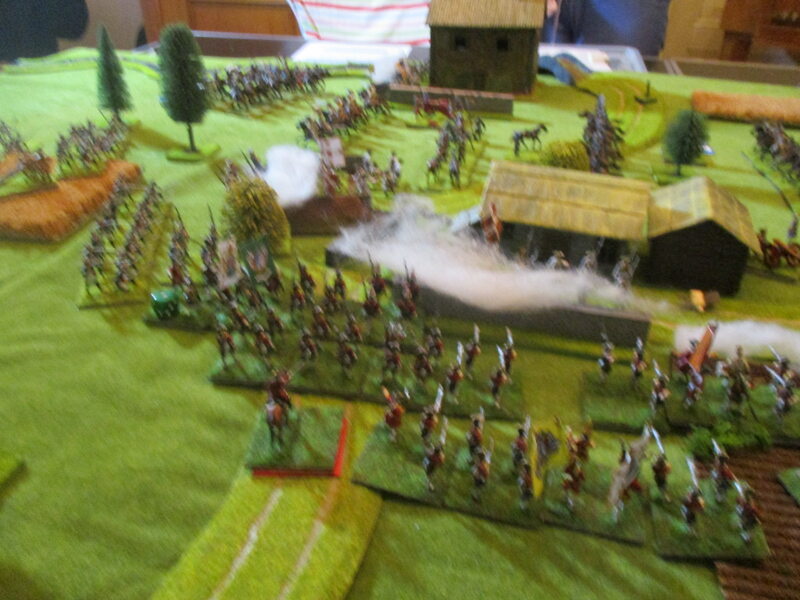 The hanoverians and dutch stormed now the redoubt and the fleeting enemy ran into the French horse. 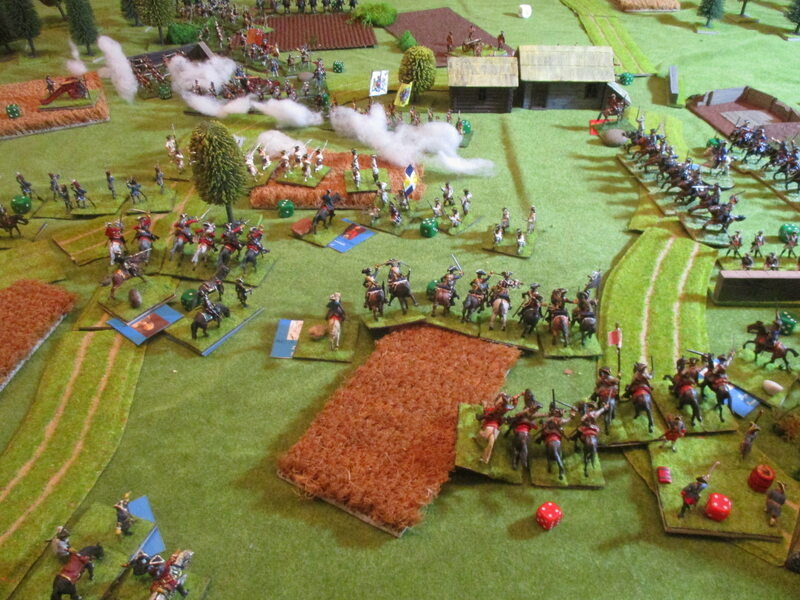 At this stage I was in a better position than ever with our infantry now at the flank of the large masses of French horse under Hérouville which were now no serious thread any longer. Ilten send his troops which had suffered heavyly during the assault back and advanced with his other troops. For half an hour both sides used their time to stabilize their positions. I voted for giving the French as much trouble as I could. 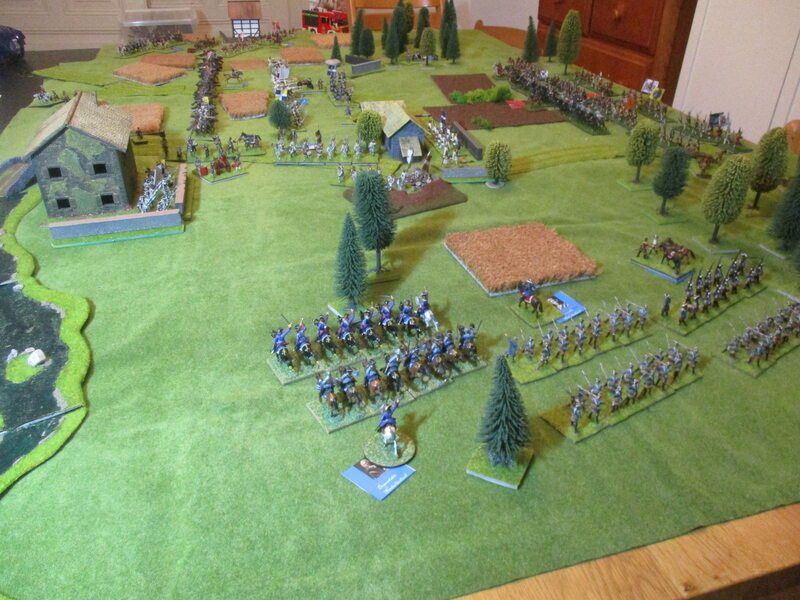 Here you see how I used the dutch horse as a Screen for Cronström's infantry column, while the French horse changed their position. Montagne pulled his dragoons into Antoing - the mighty fortress of the French at this wing. The French horse took a line between Antoing and the Justice d'Antoing where the king looked at the outcome of the battle - now accompagnied by Grammont who had nothing to do after his gardes were gone. 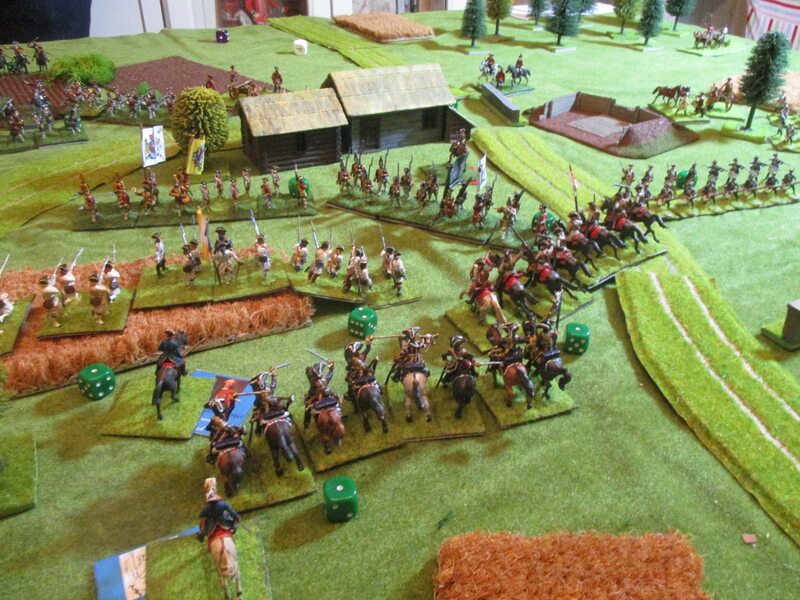 After some moments of regrouping, Ilten send two of his units forward to force the French horse to charge or get shot. 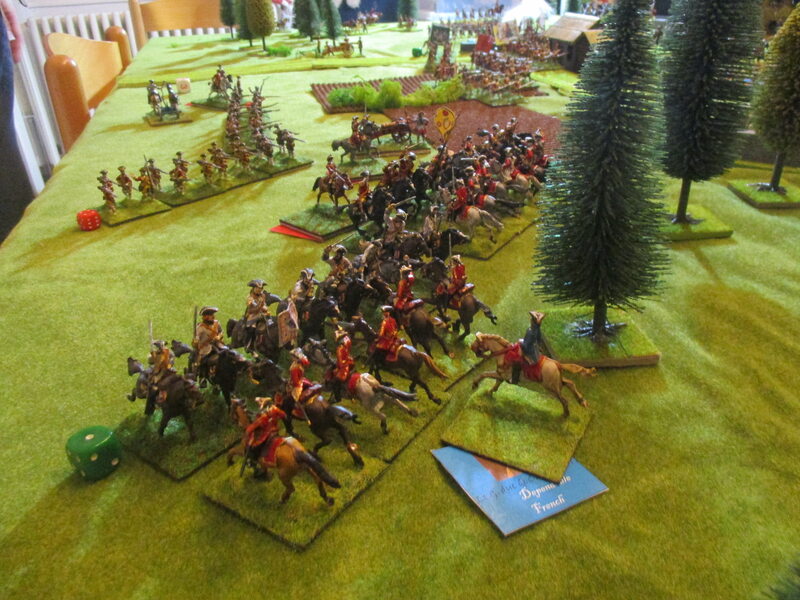 Well, they opted for their only chance to get some honour in charging into the hanoverians. The result were many horses shot down and riders falling onto the ground. One halve of the French horse could retreat but the other was done fore and destoyed by running back the other French Brigade which had suffered before. At this time the dutch shot with artillery and musketry at the French battery in front of Antoing which had fought so well for hours. 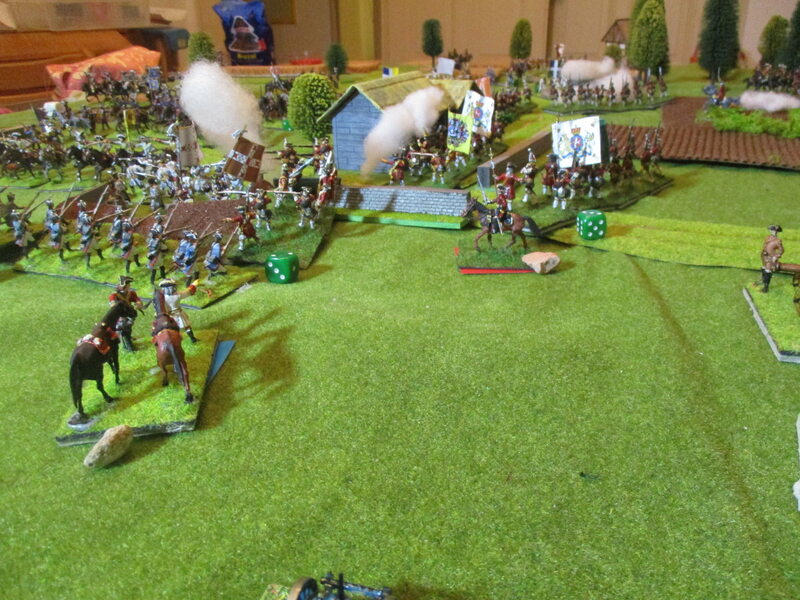 They retreated too and I saw no chance for them to get back their artillery pieces. Well we were very lucky in destroying the French around Fontenoy and Antoing. But it was just another Story at the North, where one single brigade repulsed all of Ligoniers troops for hours! Even our elite infantry, now rallied had no Chance to break into the redoubt. 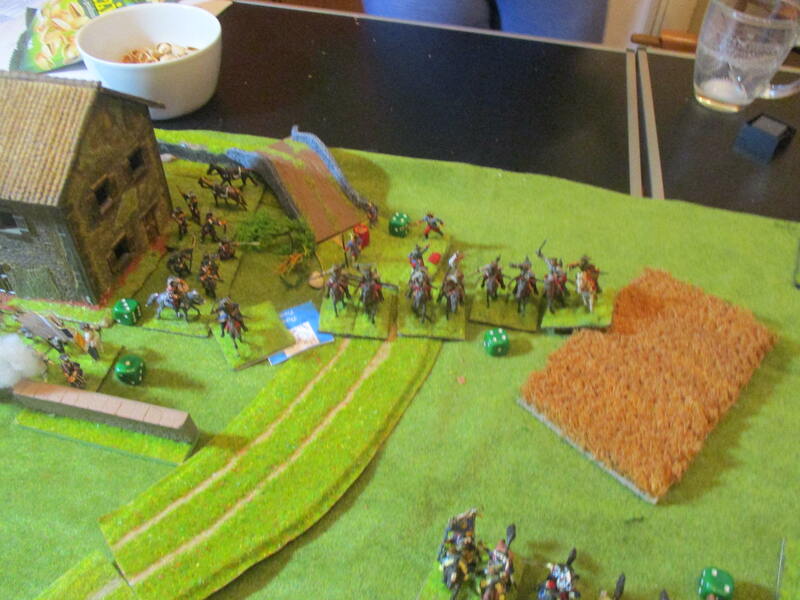 We used now 4 brigades of infantry and 2 batteries but the only result was, that they get some casualties. There was only one Chance to do the same for the next hours hoping that it will pay off because the French show no inclination to push back the defenders of the redoubt d'Eu to rally. The French lost now in 5 turns 7 brigades. That means that I've still to destroy 3 brigades or take Antoing and capture the king which is not likely. It's clear to me, that the most important thing to win this battle was to pull back the units, which had suffered too much and come forward with the fresh troops. The French had the same tactic but it became impossible when I captured Fontenoy and than the entrenchements because than there was no room to fall back. It's clear that it's very dangerous to have his cavalry in front of fine infantry. To hold the line between the king and Antoing with cavalry had no chance of success. On the other hand there were not many options left. Waldeck: Ich gratuliere königl. Hoheit zu der totaliten Ruinierung der feindlichen Kavallerie. Sie wird sich auch wohl kaum bis zum Dunkelwerden davon erholen können. Mit Bedauern muß ich allerdings mitteilen, daß meine Generale ganz zuwider einem weiteren Angriff raten. Sie wollen die Reiterey auf ein andermal konservieren. Es ist allerdings zu bedenken, daß die französischen Trouppen in Antoing ausgeruht und die Stadt gut befestigt ist. Es wird keine so leichte Sache seyn sie wegzunehmen wie es bey Fontenoy der Fall war, das nur schwach besetzt war. Campbell: My lads are ready for a last push into the shaken French lines. Ligonier just has to storm the redoubt in front of us. Ligonier: I know, my dear Campbell. We tried and we will try again. Königsegg: Iltens Bataillone haben sich ausgezeichnet geschlagen, besser als man es erwarten konnte. Wir sollten sie nun schonen und mit der Artillerie ein scharfes Feuer beginnen, um den Feind daran zu hindern sich zu sammeln. In sonderlich müssen wir Achtung darauf geben, ob der Maréchal de Saxe nicht etwa vermag Reserven heran zu führen. Cumberland: I decide to attack with all my brothers now. I would be surprised if the French could defend themself now. At friday we played our battle to the conclusion. 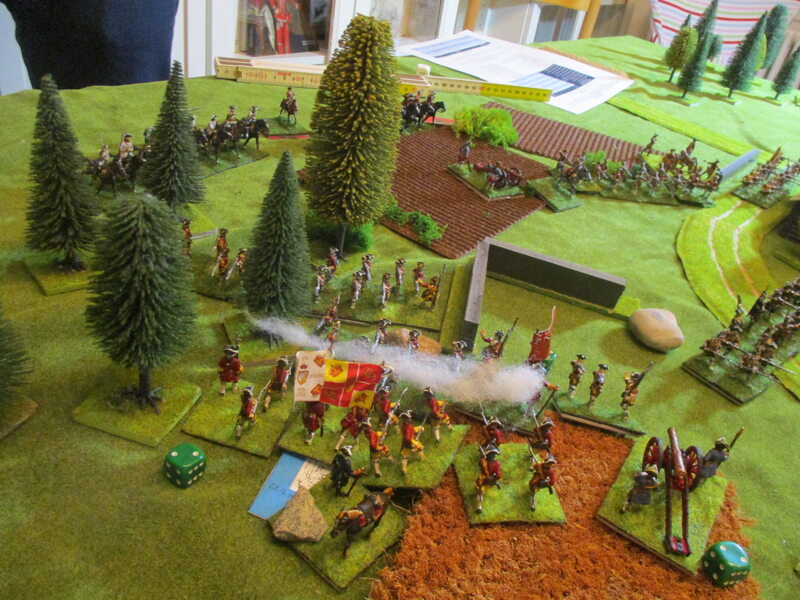 I decided to rely now almost entirely on my british redcoats. Unfortunately I forgot that halve of them had to rally off hits before they could do something really helpfull. A view from the French point de vue. Note my actions in the center. I pulled back my hanoverian infantry which suffered a lot by the French Charge in turn 6 and replaced these troops by the garrison of Fontenoy. 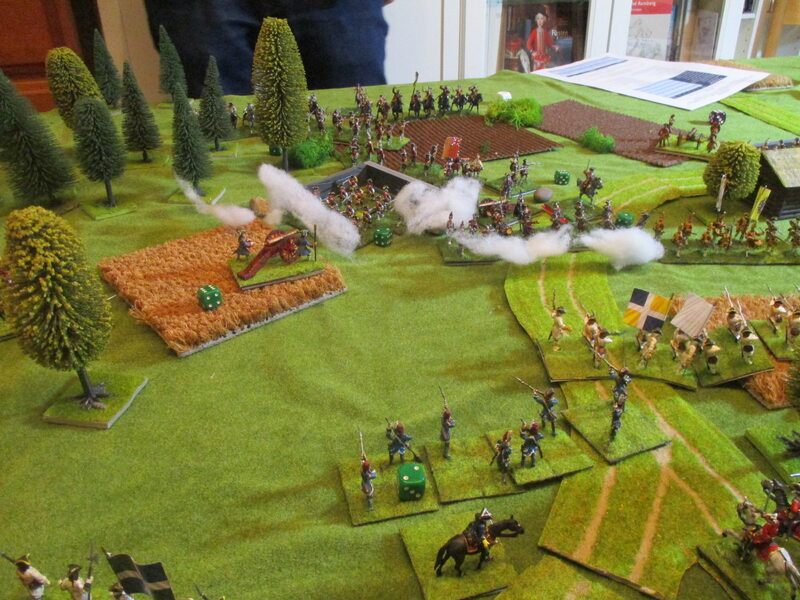 Waldeck's infantry left the redoubt near Fontenoy to advance with Cronström on Antoing - or this was at least the plan. 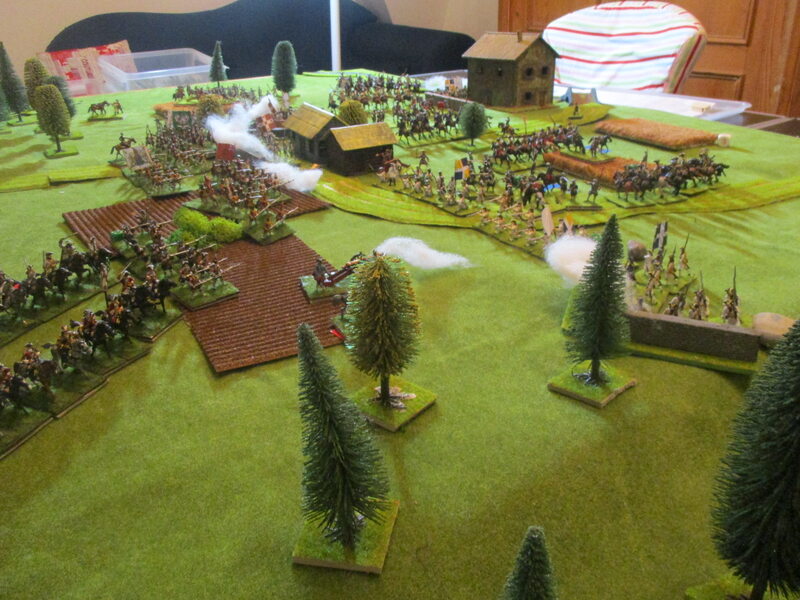 But Cronström refused and it was very likely that he was able to destroy all my battle plans. It seamed that de Saxe wanted to pull back the defenders of the redoubt d'Eu, but they refused. At the French left the wild geese advanced to attack Ligonier's forces. Waldeck's infantry and artillery gave Montagne something to think about. Later MdC Montagne prefered to pull his dragoons back, who had get enough, and replaced them with his infantry (Regiment Royal la Marine by the way). 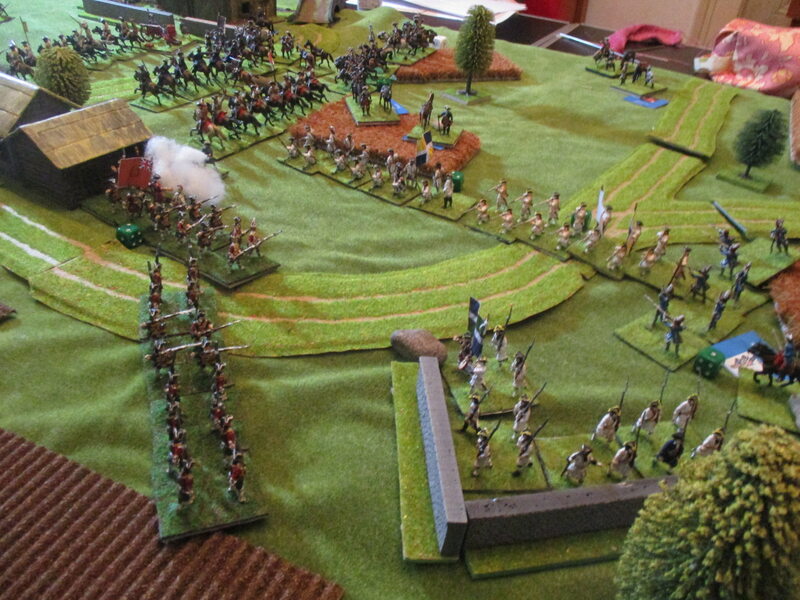 A Brigade of british infantry occupied than the redoubt d'Eu to stop the irish assault. 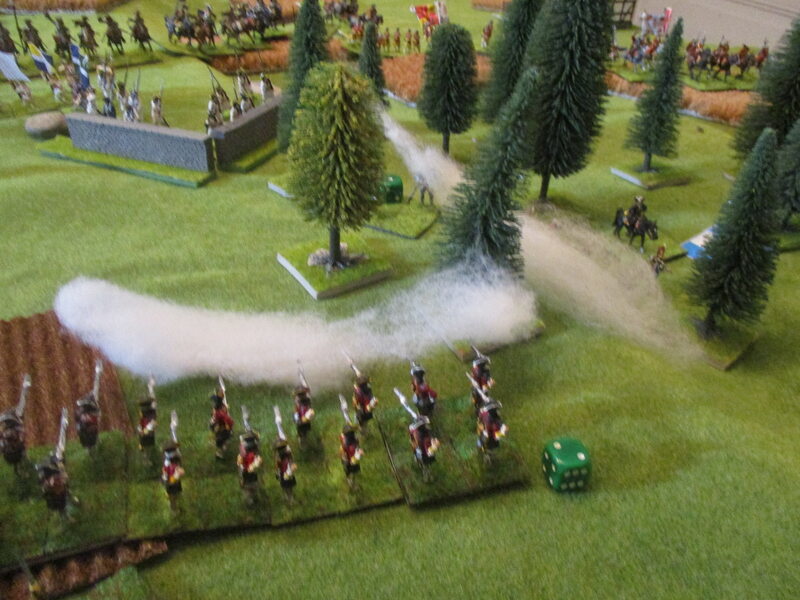 But than the irish get mad and charged into the well positioned redcoats. 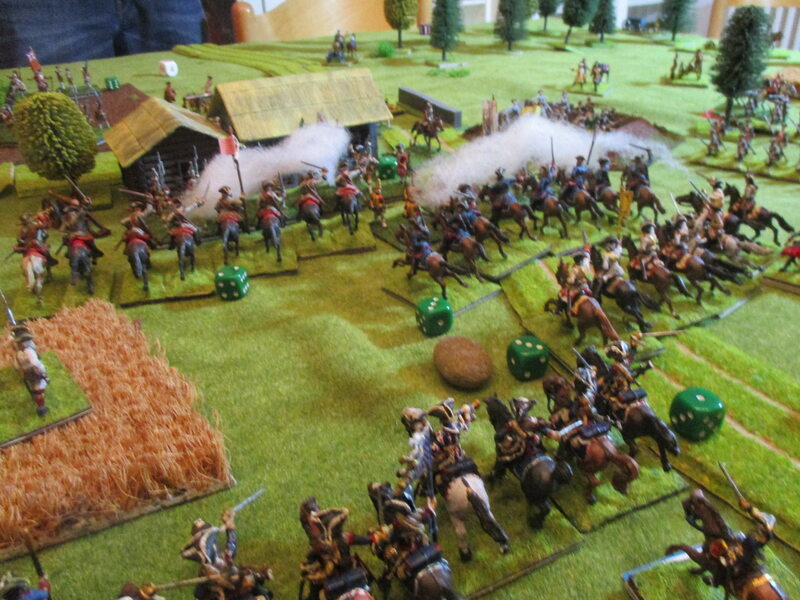 The attack faltered, shot down by effective british musketry. 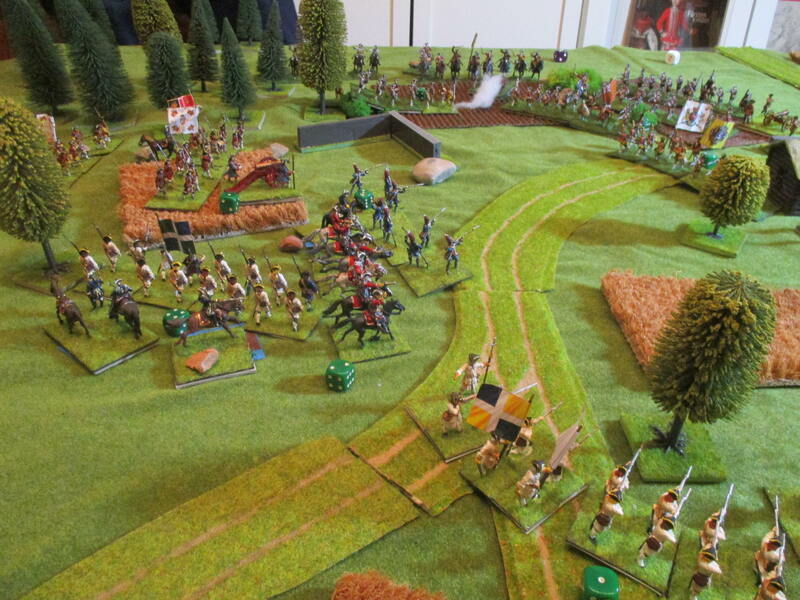 The left irish shot at the redcoats in the woods and pushed them back. Ilten advanced again with his hanoverian foot to repell d'Estrées advance at Fontenoy. But now I was surprised by Hérouvilles cavalry. The French saw their opportunity! It was a risk (2 French units I had to destroy at this moment). 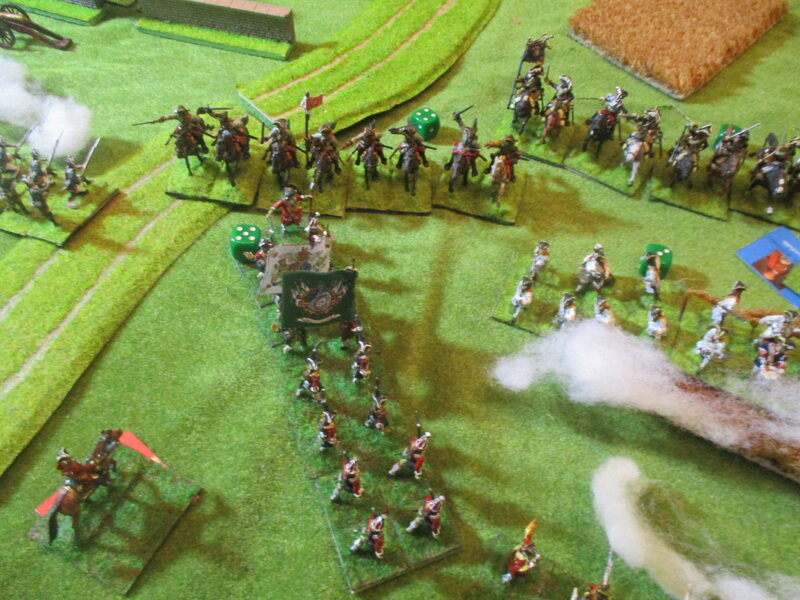 But my poor hanoverians missed to change the front and were hit into the flank. 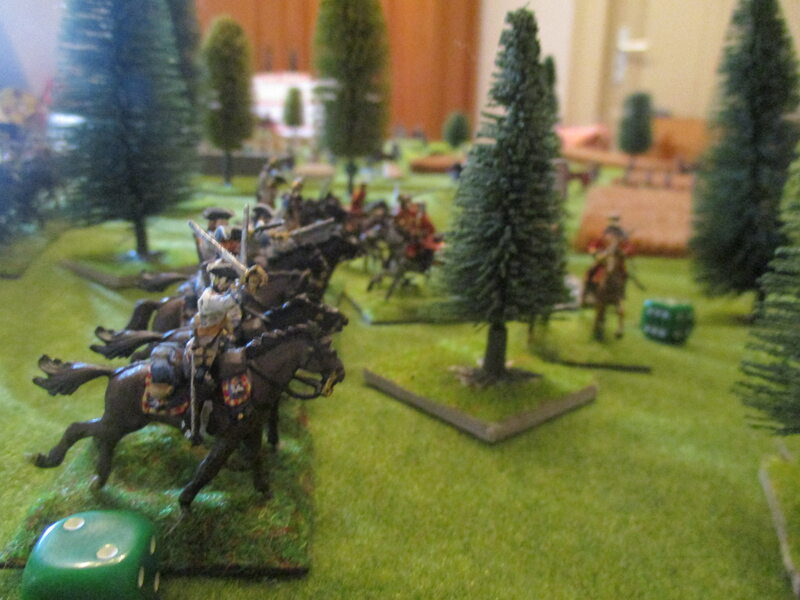 Even attacked in the flank Ilten's men fought fine and caused many casualties in the French ranks but where done fore. The French horse had to fall back leaving Hérouville with just his cuirassiers du Roi available. Now I had shortly before nightfall no other chance but to mobilze all of my troops. Waldeck's infantry was now too isolated to really storm the town of Antoing and I had to be with Ilten to make it clear that at least he would do, what I wanted. In one round not less than 4 commanders refused! Perhaps they missunderstood my wishes or simply get crazy, but Pulteney's stormed into the arms of the waiting irish. 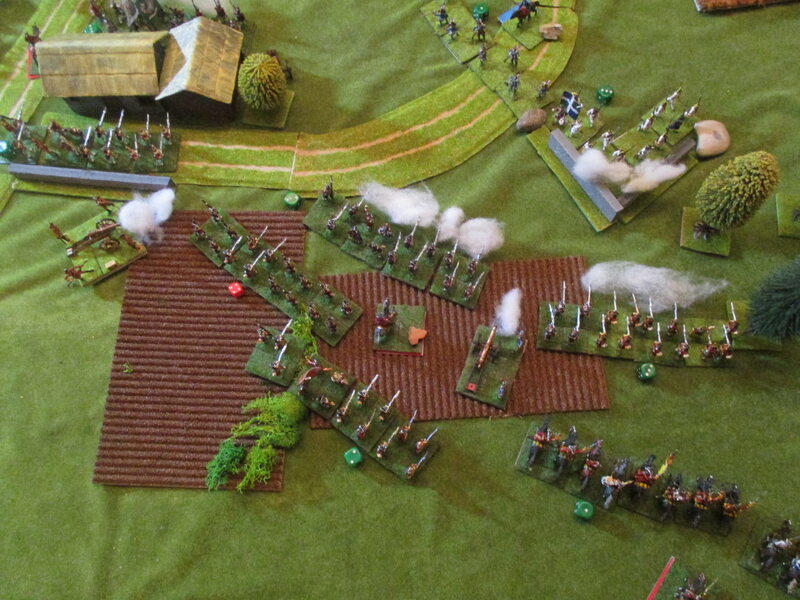 The irish shot them down and the fleeing redcoats caused the brigade at their right in the woods to retire. That meaned that halve of my best troops where not any longer able to do anything. Where was the planed british attack now? 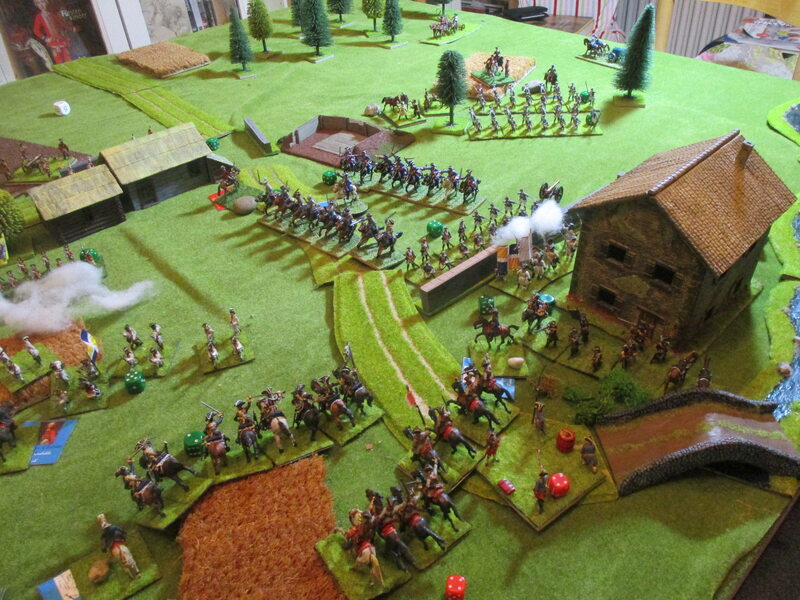 Well at least I had the opportunity to use the spirit of the inspired redcoats to send new infantry to occupy the redoubt. 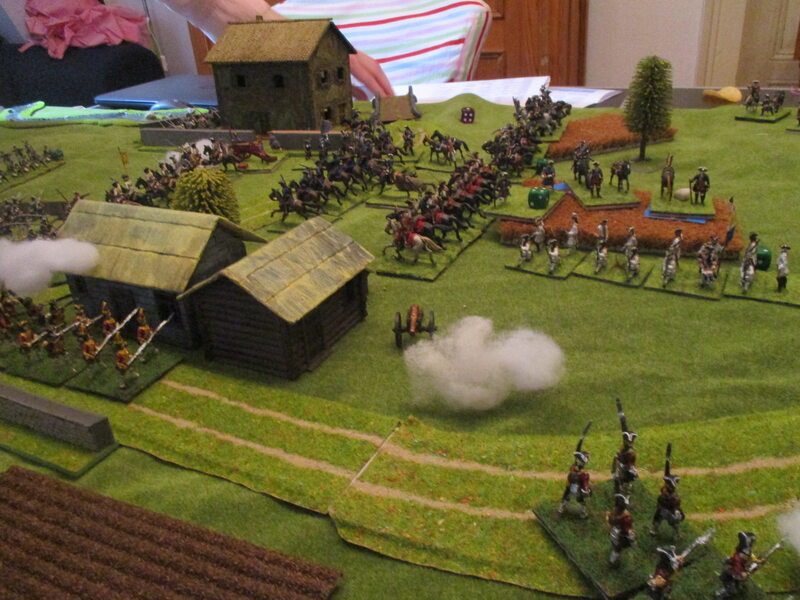 At the center the british elite infantry advanced in all their glory to shoot a fine volley. At this moment I was near Waldeck. His infantry was inspired now too and charged the walls of Antoing - although I did'nt believed that this would be of some success at all. 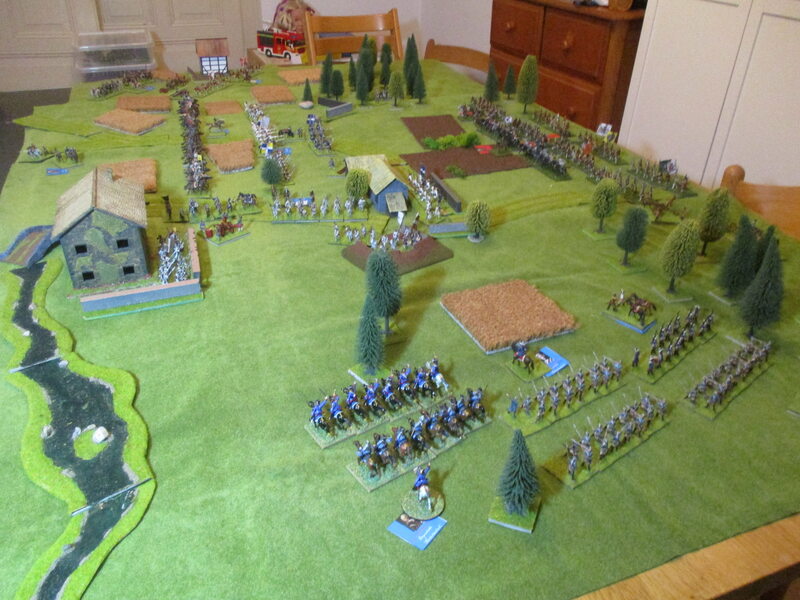 But to give as much support as possible I send in Hessen-Philippstal with his horseunits. 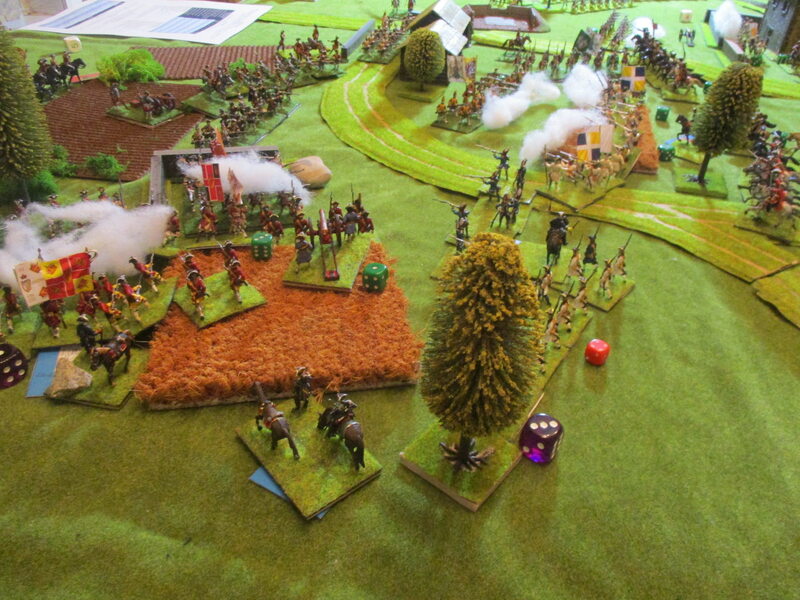 Fortunately Lutteaux prefered to pull back his infantry but left his artillery in front of the redoubt. What a luck that I got the fire initiative and the redcoats silenced the French artillery before it could fire effectively. 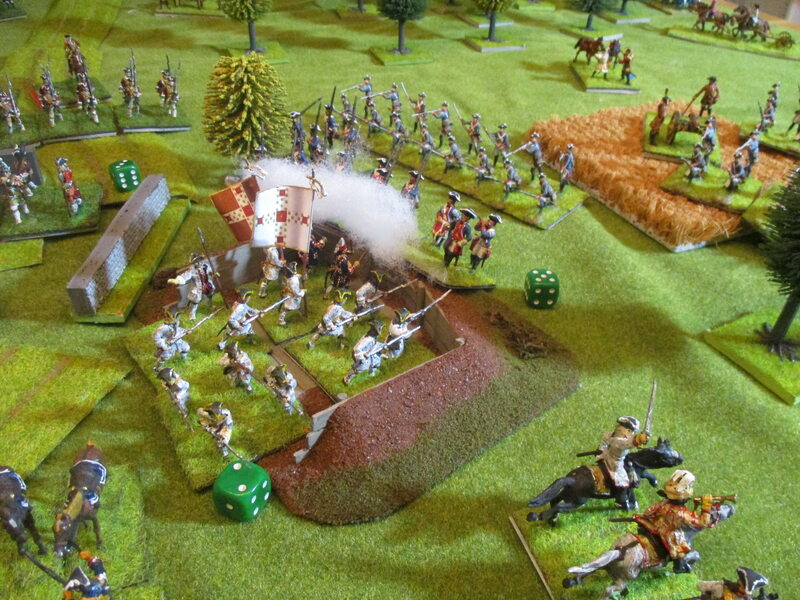 after some average (not bad) French Shooting the hanoverians did their job and shot deadly into the French ranks. D'Estrées men fled the field! We were victorious! 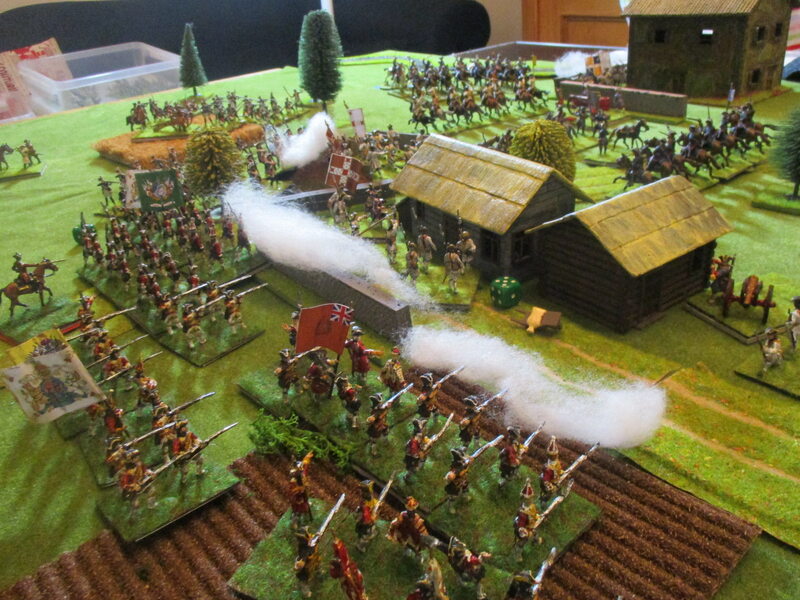 By the way we wanted to see how the dutch assault turned out and naturaly they were send back in retreat. Nevertheless de Saxe's army was broken and the pragmatic forces won a major victory. After the defeat at Dettingen the king was satisfied again. Thanks for that, damnitz. Good report. Plenty of photos. I really must try to play one of your scenarios some time in future! I'm happy that you like it, although this scenario is in most parts by Sam Mustafa. I made only some research for the right commanders etc.. For a better balance you maybe will prefer to give Montagne (defending Fontenoy & Antoing) a unit of French elite troops like swiss. But than you would change Lutteaux' troops to one superior (irish) and one Standard (French lineinfantry). I had no swiss and decided to use two Units of irish instead although if a unit represents a Brigade it would be better to have just one unit of Irish. An excellent report with a cornucopia of photographs, thank you for posting. Yeah, that's my style. 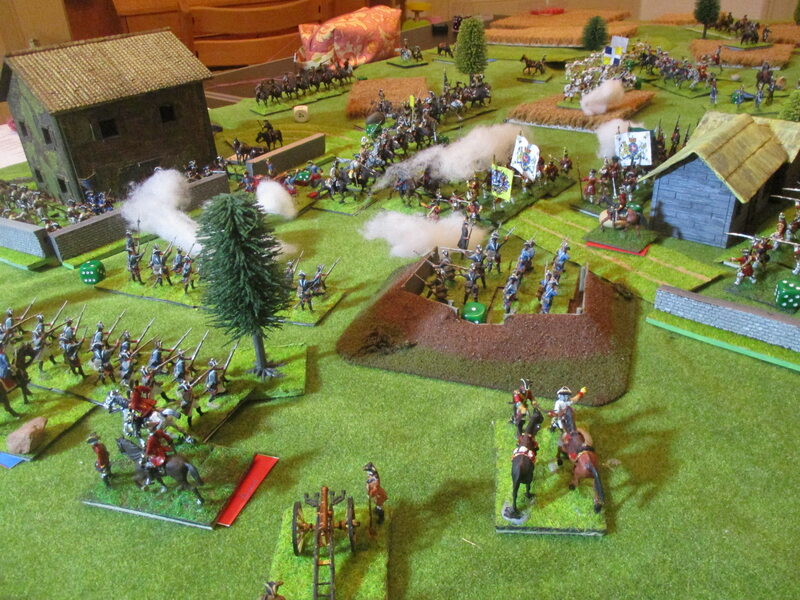 I have a guy in another Forum (a german wargaming Forum) and with him we discuss a lot about tactics and therefore it seams good to take many photos. In fact I don't know how to reflect Fontenoy properly with real brigades of bn.s using a bigger part of my collection. Well I certainly appreciate all those photos. I have now signed up to Flickr so am hoping to get more of my photos back on the site.